At CRLT, we have been hearing from many instructors seeking guidance on how to talk with their students in the days following the election. Depending on many factors, you may or may not choose to engage students in conversation about the election results. In either case, we hope the following thoughts will be helpful. If you do choose to engage students on this topic, it will be important to acknowledge the range of perspectives and intense emotions that are likely present in your classroom. These guidelines on discussing difficult topics may be helpful for framing a conversation where students with diverse experiences and points of view can engage productively with one another. You can begin by recognizing that it was a long night, everyone is likely very tired, different people have strong emotions from a variety of perspectives, and it may be hard to focus. You can give your students a brief chance to write for a minute or two -- to process their thoughts and feelings and/or identify people they want to reach out to later today, for whatever sorts of connection and processing would be beneficial to them. And then move on to your plan for the day. You could note the difficulty of focusing and of controlling strong emotions and let students know they can feel free to step out of class if they need a minute to refocus. If a student raises the election as a topic when you hadn't planned to discuss it, these resources may be helpful if you want to engage everyone in conversation. If you do not feel prepared to do so, you can recognize why the student might want to have the conversation, but explain that you want to think further about whether and how to engage it as a class because it is important to do so carefully given the intense emotions and divergent perspectives around this election. 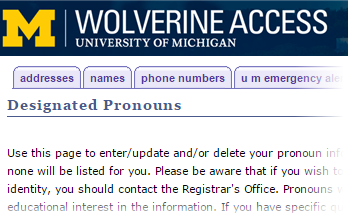 As most U-M instructors have probably heard, the university now allows students to designate personal pronouns in Wolverine Access that will automatically populate class rosters. What can instructors do to help make this initiative a success, benefit from it in their teaching, and more generally create learning environments where students of all gender identities feel welcome and valued? Remind students to update their pronoun designations. Consider making a brief announcement in class, and/or sending an email to your students, reminding them that the option to designate their pronouns now exists. 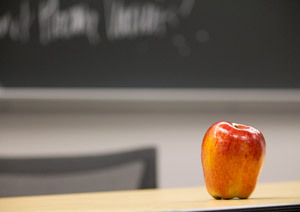 Teachers can post or include the instructions for making these designations via Wolverine Access, and take the opportunity to mention that students should always feel welcome to communicate with and correct you if you misidentify them. Inviting students to make use of this policy--and showing you value it as a way to make sure your learning environment is respectful and inclusive--might also discourage students from using the new functionality in disrespectful ways that can undermine its usefulness. Check your course rosters starting in late October for updated pronoun designations, and carefully review your rosters at the start of each upcoming semester. Do your best to honor students requests in all settings, including when speaking of the student outside of their presence. Practice pronoun usage that may be unfamiliar. It can be difficult to adjust to grammatical forms or pronoun usage that feel new or are unfamiliar. The best thing to do is to practice these ways of speaking to become fluent. Draw on available resources such as this page from U-M's Spectrum Center or this guide from the Pensby Center at Bryn Mawr to learn about the pronouns and to practice their use. When you make a mistake, you can simply acknowledge and apologize, and avoid making excuses or expressing frustration about your own need to adjust your language. Similarly, if someone else mis-genders or misidentifies a student—in their presence or not—you can gently remind and correct. On future syllabi, note the opportunity to designate pronouns. On future course syllabi, consider including a gender inclusive statement along these lines: "All people have the right to be addressed and referred to in accordance with their personal identity. In this class, we will have the chance to indicate the name that we prefer to be called and, if we choose, to identify pronouns with which we would like to be addressed. Remember that all students can and should indicate their personal pronouns via Wolverine access, using the Gender Identity tab under Student Business. I will do my best to address and refer to all students accordingly and support classmates in doing so as well."